The delightfully sounding Scottish trifle dessert of tipsy laird truly is, without a doubt, a thing of beauty. The light dessert is traditionally is served on Burns Night or at Hogmanay, but, having said that, this dessert is so delicious and so very easy to make, why save it for just one night a year? It is far too good for that. The beauty of the dessert is not just the flavor, tipsy laird is pretty to look at too and unbelievably easy to make. What is not to like? 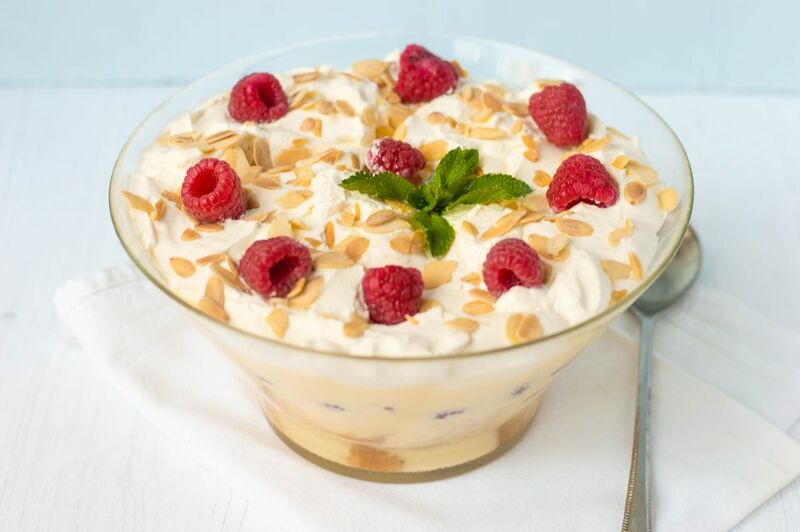 A tipsy laird is essentially the same as a classic English Trifle, the pudding that has graced British tables for centuries, but this Scottish one uses whisky, not sherry, and (where possible but not essential) uses Scottish raspberries. Scottish raspberries are renowned worldwide for being the best, so if you are lucky enough to be able to use them, then great. However, any good, fresh raspberries will do the job. Do not, however, ever use frozen: they do not work. Jelly may not always be used, but no trifle is complete without custard. This trifle though is so quick and easy to make, as it uses ready-made custard or you can make it with custard powder following the packet instructions. For an even richer dessert, finish the trifle by grating dark or white chocolate over. Line the bottom of a large class dish or individual glasses with the already cut thick cake slices. If you are using one large bowl use all the cake in one layer if you can. Reserve a few of the fresh raspberries for decoration, then layer the remainder evenly over the cake slices. Again, in the large trifle, one thick layer is good. Sprinkle with the whisky, making sure it soaks down to the cake. Spoon over the ready-made custard, again in another thick layer. Finish with a further thick layer of whipped cream, either spooned over or piped using a piping bag. Finish the tipsy laird by decorating with the reserved raspberries and a few toasted, flaked, almonds. A tipsy laird doesn't keep well. Prepare and serve fresh for best results. You can omit the whisky if you are serving the tipsy laird trifle to children.